200 People, Retro Multiplayer, No Internet. It's Madness. On the weekend, the Personal Computer Museum in Ontario, Canada held its annual "Game Night", throwing open its doors and letting around 200 people in to get their hands on a ton of vintage video games, which can be played on their original hardware. Thing is, there's a catch. There's no internet allowed. Anywhere. If you want to play against someone, you do it on the actual hardware, and you do it the old-fashioned way. It leads to a cool night's fun and education, but this year the museum spiced things up a bit by creating their own multiplayer controller, which could be used in games that weren't ever designed for multiplayer. Like Pac-Man on the Commodore 64. "We took a standard Atari stick connector and wired up each major direction (plus fire) to a modified doorbell", PCM's Syd Bolton tells us. "The doorbells were mounted in blocks of wood that we used a drill press on to make holes for cables, painted and sanded them up and made controllers that could be used by one person." 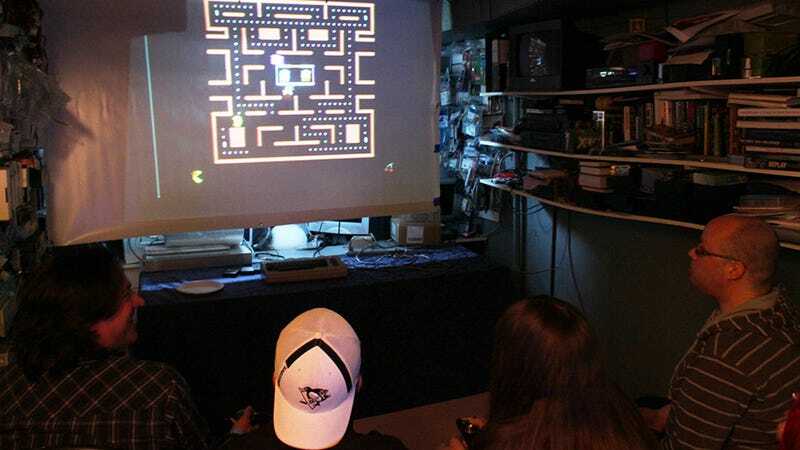 This meant that Pac-Man could be enjoyed by four players at once, with each player controlling a direction, which Syd tells us was not only hilarious, but also resulted in a few game-breaking moments, as the old titles weren't designed for people to be mashing different directions at the same time, which caused a few collision detection errors. Interestingly, Syd says that as the night wore on, the custom controller didn't just lead to frantic multiplayer, but the emergence of team-based strategies, such as employing a single leader to stand back and shout orders, like a Roman galleon captain. They also tried the controller out on Avengers, an old Space Invaders clone, with some people moving the ship while another had to fire. Same confusion, same hilarity. The Personal Computer Museum is home to the biggest collection of video games in Canada, with over 15,000 titles. If you feel like a visit, or have any retro games you could donate, check out their website.